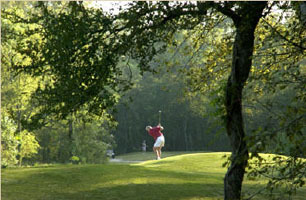 - Voted as the favorite course in Southwest Houston in the Houston Chronicle's 2011 Golf Guide. - Voted best public course in Fort Bend County in 2003. Sienna Plantation is one of the Houston area's most enjoyable and challenging places to play. The terrain is fairly flat, but the course has been contoured to provide dramatic elevation changes that will accent and enhance the design with artistic forms and shadows. Live oaks, and an abundance of mature cedar elms and other native trees provide a naturally wooded setting. Broad lakes and winding creeks are intertwined with golf course corridors to create distinctive risk/reward shot values and stunning homesites. The course was designed by Arthur Hills and Mike Dasher. Arthur Hills is one of the nation's leading golf course architects and the recipient of numerous awards for course design. In 1991, he achieved a rare "double" when two of his designs were dubbed "Best New Private Course" and "Best New Public Course." A golf course designer for 25 years, Hills' work includes more than 100 original layouts and another 100 renovations, including such prestigious courses as Oakmont, Inverness and Crystal Downs. Two of his designs, Bonita Bay and the Tournament Players Club at Eagle Trace, have been named to the Golf Digest list of Top 100 courses. Among his many other accomplishments, Hills is the designer of the picturesque Bighorn Golf Club, site of the nationally televised "Skins" game. Mike Dasher of Dasher Golf Design was one of the top designers with Arthur Hills & Associates for 16 years before opeing his own firm in 1997. He and Hills continue to collaborate, as in the case of the Sienna course. During his career, Dasher has assisted Hills in the design and construction of over 40 new golf courses, including numerous award-winning projects, as well as courses that have hosted PGA Tour and Senior Tour events, Collegiate Tournaments and State Championships. Sienna Plantation Golf Club has a very large practice area that includes a huge grass tee, practice bunkers for both greenside and fairway bunker shots, and a practice green that can be used for chipping and putting. Golf instruction is a priority and programs to fit the needs of all levels of golfers will be ongoing.